On the occasion of ‘Moorchhana’: the 9th Annual Day of ASBM, Shri Richard Rekhy, CEO, KPMG India has been conferred ASBM Award for Excellence for the year 2015, by Hon’ble minister, MSME, Govt. of Odisha, Shri Jogendra Behera, in recognition of his pioneering work as a leader of the leaders in the corporate world, and as a tribute to his sagacious vision and quest for excellence. 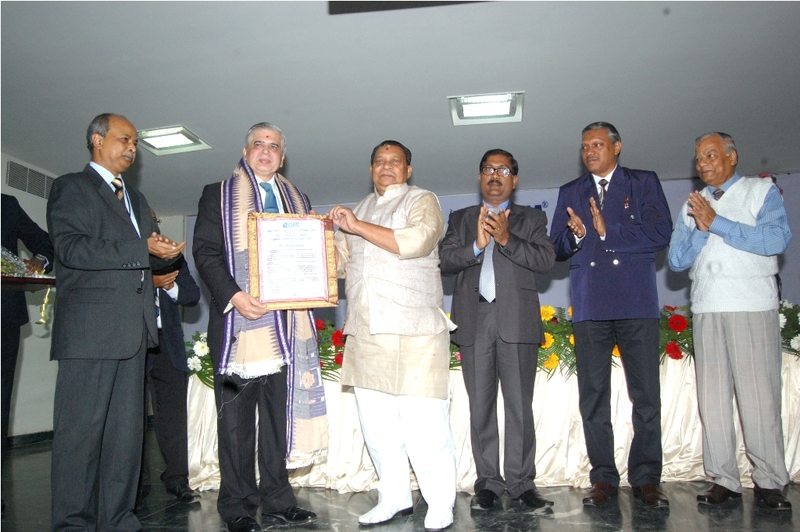 In his acceptance address, Shri Rekhy thanked ASBM profusely. He said that youth are always his biggest inspiration and India is rich with largest number of youth in the whole world. He showed the concern and importance of educating the youth. He inspired the students to introspect and reflect before they do something and assured that this introspection always brings out a smooth result. On outlying the world scenario he said that we are running in a marathon where the rest of the world is in a doldrums. He stated that this is our moment in the history and we have to take advantage of doing something for the country by involving ourselves in Startup India, Digital India, Make in India, Swachchha Bharat Abhiyan and alike. He added that we have to recognize our responsibility and accountability for this country. He kept the audience attentive and impressed with number of thought provoking short stories in his speech. Shri Jogendra Behera Hon’ble ministers, MSME, Govt. of Odisha, Chief Guest of the occasion inaugurated the programme by lighting the lamp of wisdom. He urged all the student evoke their inner thinking and do something for the motherland. He appreciated ASBM’s gesture of selecting Shri Richard Rekhy for the award of excellence as this shows the vision of this country. This land is required to move ahead and his department has potential to make a manufacturing hub. His department is extending a helping hand for all those who need it. Prof. (Dr.) Shyam Sundar Pattnaik, Vice Chancellor, Biju Patnaik University of Technology, Guest of Eminence of the occasion emphasized on the various scenario of management. He spoke about technological advancement and adaptation process. Prof. (Dr.) Biswajeet Pattanayak, Founder & Director, ASBM expressed his concern over mushrooming of the institution without credibility and credentials which is adversely affecting the educational scenario of the state. He thanked all the dignitaries for their presence. Then achiever students in different competitions were awarded. Students who performed well in competitions like Volley Ball, Cricket, Badminton, Chess, Carrom, Table Tennis, Songs, Skit, English Debate & Extempore, Business Quiz, Essay Writing were appreciated and awarded by the Director and guests. Apart from this, Shri Manoranjan Mishra was awarded as Best Employee in administrative staff category and Binoya Bhusan Das was appreciated as Best Employee in Technical, Support & Housekeeping Staff Category. A blood donation camp known as ‘Joy of Giving’ was organised in the campus where students, staff, members of faculty and Associate Dean of the institute donated blood as a gesture of responsibility and contribution to the society. A total of 71 blood units were collected and participants were given a ‘certificate of appreciation’. A plantation programme was also organized by the teacher and students of ASBM at Chandaka Primary School, Dalua Ashram School, Kujimahal UP School and Kantabada High School. Prof. (Dr.) Biswajeet Pattanayak, Director, ASBM planted one Sandalwood tree inside the campus. Introduction of the guest has given by Prof. Bhakta Bandhu Dash, Coordinator, Students’ Affairs committee and Shri G. Upadhyaya, Formaer CMD, NALCO & Associate Chairman, ASBM Board of Governors proposed the vote of thanks.